“Isang oras pa.” With those words, I felt tears welling in my eyes. “No kidding..” I answered back, exhausted. “I wanna go down, ” I said to no one in particular. Rowell whose jokes kept us laughing amidst the tiring and seemingly endless assault up Hibok-Hibok was perched quietly on a rock a few steep meters ahead of me. He looked grim and spent. We had underestimated Hibok-Hibok. Four of us had already turned back and while the reminaing 9 of us plus two guides were wearily pushing-on. Earlier on, Ari, the EL exclaimed, “O tuloy-tuloy na… i-push na ang dapat i-push.” 30 minutes later, expecting to be nearing the summit already, it was totally heart-breaking to be told that we were still an hour away. We had been climbing for close to 3 hours with hardly any water and food left. We were still right on schedule as it was just close to 10am but we were hungry and the trails were horribly steep and slippery. With a few others, I had planed in the day before at 6 in the morning at Cagayan de Oro, met the rest of the party at the Agora bus station for the 2-hour trip to Balingoan and the 1-hour ferry to Camiguin. 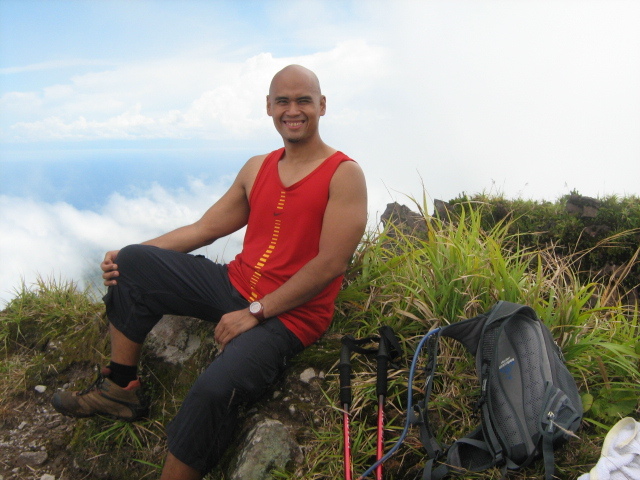 And here I was in the forested slopes of a volcano, an hour away from the summit, and I wanted to turn back. After much thought, I decided, “Might as well…” After all, what is an hour of clambering-up rocks after a plane, a bus, and a ferry ride. There is no rest for the weary. It’s just one slippery moss-covered rock after the other. You clamber on one and grab onto a tree root or another rock to hoist yourself up. With such fertile soil, the trail is covered with ferns and other plants. It had rained hard the previous night so the ground was wet. Finally, we see Ari with his butterfly wings on his back smiling cheerfully. 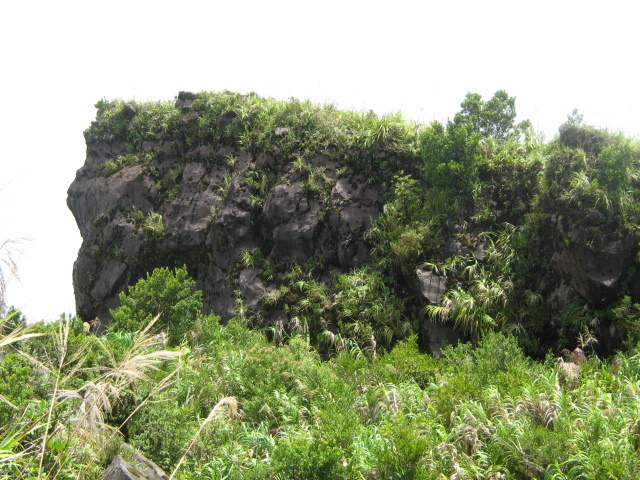 We come out on a small clearing and stony outcrop. We have summited! The crater, not like the usual bowl-shape drops dramatically down to one side and the guides warn us to watch our step lest we roll all the way down. The fog has cleared and we have a magnificent view of the surrounding sea and mountains. All weariness is lost and out come the butterfly wings. With Congressboi back at Ardent probably enjoying the hot springs, I get to try on his angel wings. It is quite cold at the summit with the fog coming and going. A few more photo ops and we were back on the trail for the slippery descent down. 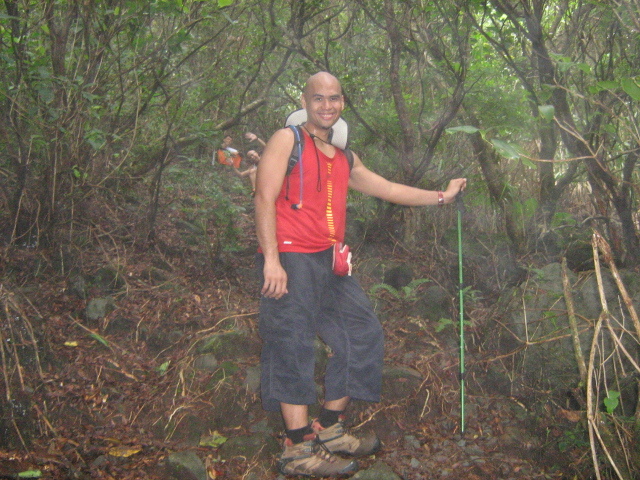 I was really really hungry by then and by the time we reached the fern forest with its flat terrain, I was walking as fast as the trail would allow me. I could see the valley below and I couldn’t wait to get to the water source as my throat was really dry. It came as an utter shock when the clearing gave way to another steep descent down some large moss-covered rocks. My legs were really hurting by then and my body was craving for food. Climbing is a mental as much as a physical exercise and I was on the verge of just giving-up. As safely fast as I could, I slid down and finally reached the valley. A few hundred meters away was the water pipe. As I lay on my back, thirst quenched with cool sweet water, i looked at the carabaos lazing away in the mud and wished I could be as relaxed as them. Hibok-Hibok loomed tall and forbidding before us; its peak once again blanketed by fog. As soon as the rest arrived, we trooped back to Ardent. A lesson learned from this climb is to never ever under-estimate a mountain.